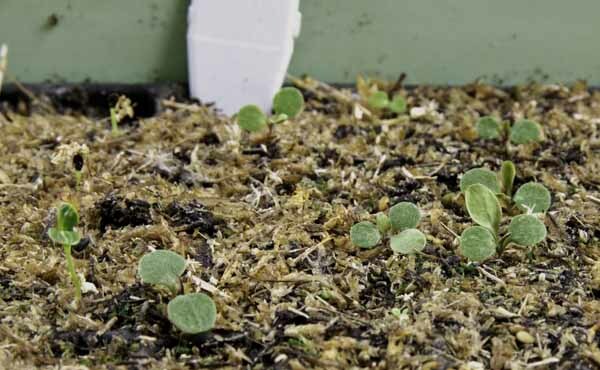 Another sign of spring’s approach – flats of seedlings growing under lights. On the left are tiny petunia seedlings, which can be a challenge to grow. I start with pelleted seed, which is more expensive, but worth it since I get much better results. Pelleted seeds are covered with a coating that dissolves in water. The pellets are still small but are much more manageable than the tiny, dustlike seeds. 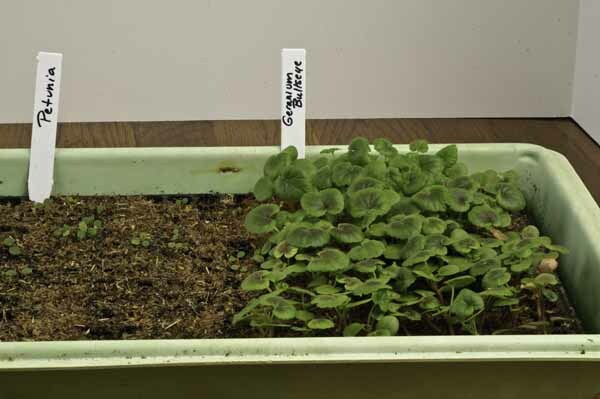 The bigger seedlings on the right are geraniums, and they were seeded the same day as the petunias. I’ll transplant the geraniums into 6-packs or small pots in a few days. The petunias still are sprouting, so I’ll leave them in the current cell-pack for a while longer. The seedling on the far left is a new variety of vinca that I’m growing. It’s supposed to do well in hanging pots. We’ll see. Look at those thick, healthy stems. I love growing my geraniums from seed. 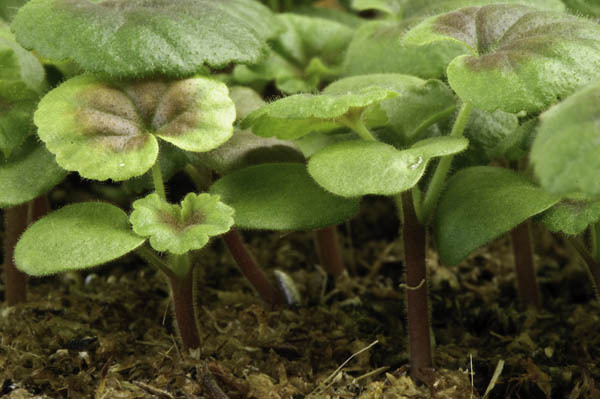 They’re not difficult, but they do tie up space under the plant lights for a long time. I started all the seedlings in this flat the first week of February, and that’s later than I like. Growing in another flat are broccoli, cabbage, kale, and early tomato seedlings. Why grow from seeds though? I hear they’re pretty easy to grow and propagate once they’re big. Well I haven’t experienced that personally since my petunia is struggling but that’s what I hear. Aren’t geraniums flowering plants too? They grow a lot faster don’t they? Geraniums do go quickly, and the flowers are beautiful. As for petunias, they don’t over-winter well here, so we start fresh each spring with seeds or purchased seedlings. I choose seeds because the types I want aren’t always available locally, plus it’s fun. Seriously? So the plants die out every winter? It must be expensive to maintain those gardens then. But then again, you get the satisfaction of growing new ones every spring. Chris – Yep, new plants every spring for petunias and the like, though I also grow lots of cold hardy perennials. I can’t imagine the cost and trouble of having to replace everything each year. For some gardeners that also experience winter, I read that some of them place the plants indoors to fight against the frost. Chris – A lot can be wintered over in greenhouses or sunny windows. Usually it’s a matter of space and light quality — the farther north you go, the shorter the days are. I’ve held geraniums and begonias over, jasmine, various ferns, rosemary, and a few other herbs. Snapdragons will overwinter in an unheated greenhouse here. Never had much success getting impatiens or petunias past December. Hello again! I plucked blooms from my Petunias. I dried them for a couple of days and planted the seeds. I placed them in small, well drained cups with good soil and I covered the tops with plastic. How long before I can expect the seeds to start germinating? Was I correct in the first place? The seed like stuff I found in the flowers are the seeds I should plant? It’s been almost a week and there’s been no sign of life. Help!